A day to educate, shout from mountain tops (only if possible), tweet, blog, and create Facebook pages on how we can achieve social acceptance and awareness of disability. A day to honour the late Annie Hopkins, founder of 3E Love and creator of the International Symbol of Acceptance. According to the Oxford Dictionary, the definition of Acceptance is as follows: the action or process of being received as adequate or suitable, typically to be admitted into a group. Adequate or suitable? Not exactly what acceptance means to me, and it’s not what acceptance means to the incredible people at 3E Love. Truth be told I much prefer the definition below. Acceptance is an Empowered movement that Educates others to Embrace diversity and Love life by seeing beyond abilities. Friends, tell the world you embrace who you are; a person with social rights, who has an opinion, who has interests, who has goals and who loves life; a person who is empowered to make a difference in the world and not be without a voice in society. You are not living disabled, you are living. To our supporters, join us in telling the world that you are accepting of people with disabilities. As our parents, siblings, relatives, spouses, children, lovers, coworkers, teachers, personal assistants, friends, and anyone else – you also have a role in our culture and life. And you can have an impact on the future if you demonstrate your acceptance to others. The 3E Love Symbol was designed by Annie Hopkins who also cofounded the company with her brother Stevie Hopkins. Both Annie and her brother Stevie have Spinal Muscular Atrophy Type 2. Annie passed away from complications in 2009. Stevie has continued to guide the company in honour of his beautiful sister Annie. 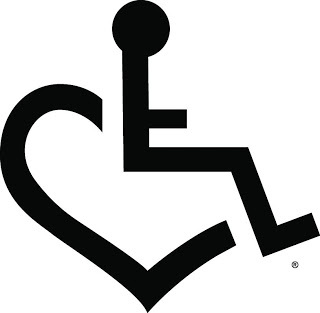 3E Love’s registered trademark, the “International Symbol of Acceptance” also known as the “wheelchair-heart logo,” is the drive behind much of the company’s goals and products. It is a symbol of society accepting people with disabilities as equals and a symbol that people with disabilities accept their challenges and even embrace them. By replacing the wheel with a heart, the stigma of the wheelchair is also removed, and it can be a symbol for people with any disability or impairment. It represents the person, not society’s perception of him or her. The 3 E’s in their name are powerful to everyone including myself on so many levels. Embrace, Educate, and Empower. Please take a moment to check out their website 3E LOVE. If you like shopping then you will LOVE the 3E store! I already see several purchases from there in the near future. I’m thinking a cool decal for Ladybugs Squiggles, and a pink tee for this mama. ← Happy 3rd Birthday Ladybug! Thanks for sharing this! I have never seen this logo before… I looove it! I think I will have to buy a shirt too..